For anybody who doesn't know: The Philippines was a commonwealth of the U.S until the U.S gov't. gave Philippines it's independence. Above story explains the bottles I found are "made in the Philippines" (new bottles are made in France). Very rare, probably 50 years old ink (I don't know). These bottles are mint, never been used, in mint box. 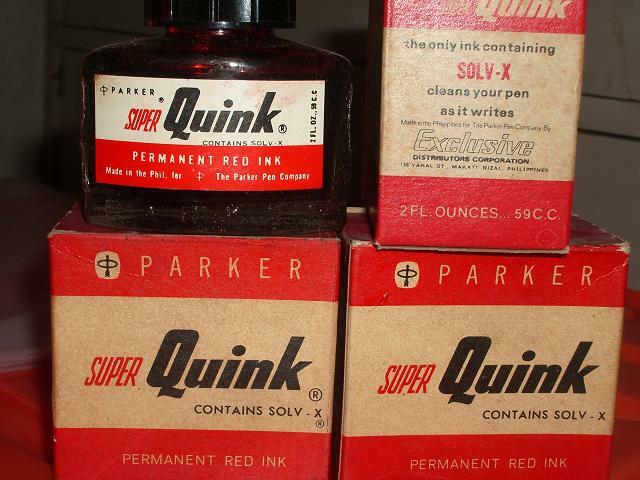 Very vintage quink ink: 10 bottles only, color: red. Edited by bat, 09 January 2009 - 02:44. Another case of the Wikipedia not being anywhere near the truth.... 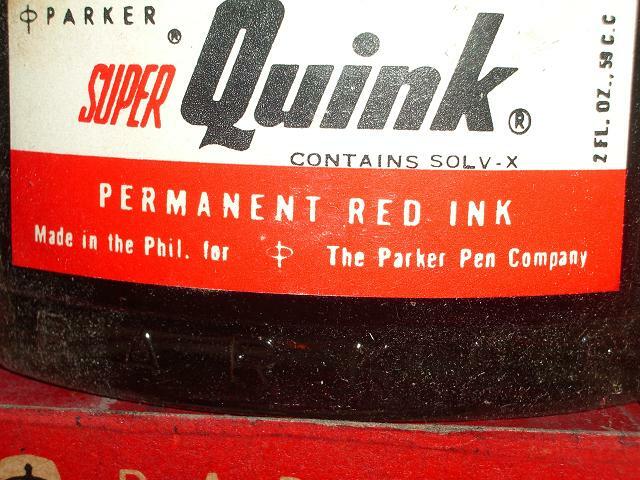 There is very little that I trust from Wikipedia which is written by the people reading it, not from reliable sources..
Quink was launched in 1931 and was developed by Gaylen Sayler a chemist employed by Parker to set up a new research department... the name was derived from quick drying ink. Yet another reason to never cite Wikipedia as a source for anything. Read the Parker 51 book, the whole story is there. Edited by Glenn-SC, 08 January 2009 - 17:58. It has some utility in that you can look at the citations offered and use THOSE as a starting point for research... you know, when there are citations. Did any of you folks read the wikipedia entry? It says right at the top (I accessed it on 8 Jan 2008) that the factual accuracy of the article is disputed and that it only cites a single reference. The article said nothing about the ink being manufactured in the Phillipines, nor that the name of the ink came from the Filipino. The ink name is stated to be a portmanteau of quick and ink. I find wikipedia very useful, but it is not the last word. Nor is any published work, regardless of the author. So we should all consume with our eyes open and brain in gear. If you're willing to donate some time, it's easy to edit the wikipedia pages. I do so when I find errors or omissions -- it takes little time and makes it a better resource. Posted pictures for reference. Fake a pen, acceptable, Fake an Ink with matching box? I don't think so. Even the color of the box is antique. That is fake also? Hard to believe. But it is subject to debate. I even kept the receipt, from the old bookstore that I bought it from. Let's assume wikipedia is wrong. It does not mean, somebody who wrote a book is 100% perfect. He/She, the author (the Shepherds) might be wrong also, or missed a thing. When I was in the University studying, there was a saying, "if you know everything, then don't study". If someone makes a study/thesis/analysis, it does not mean, you are the absolute truth/like the the gospel. (even the gospel is subject to debate). It applies to Wikipedia and to any other books. Let's assume, I wrote a book with lots of pictures, a lot of descriptions, lots of history, does it mean my book is perfect? That there is nothing that I wrote that requires debate/correction? That it is the absolute truth and nobody will dare say, I missed a thing? As educated human beings, we should keep an open mind, wikipedia might be wrong, but then again, it might be correct. Edited by bat, 09 January 2009 - 03:27. Just because the ink was manufactured in the Philippines doesn't mean that a Filipino invented it. Many companies license their products for manufacture in other countries simply for cost reasons. 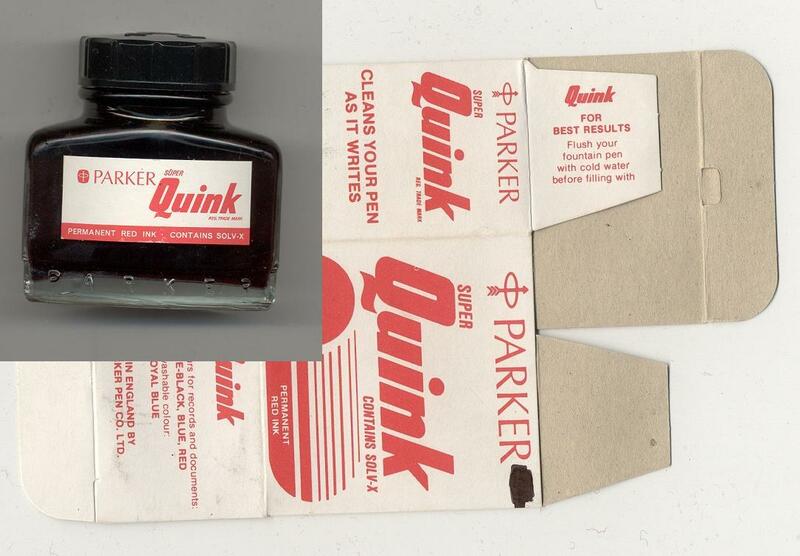 Whether the Quink is authentic or not depends on whether Parker licensed "Exclusive Distributors Corporation" to manufacture the ink. This has nothing to do with Wikipedia. 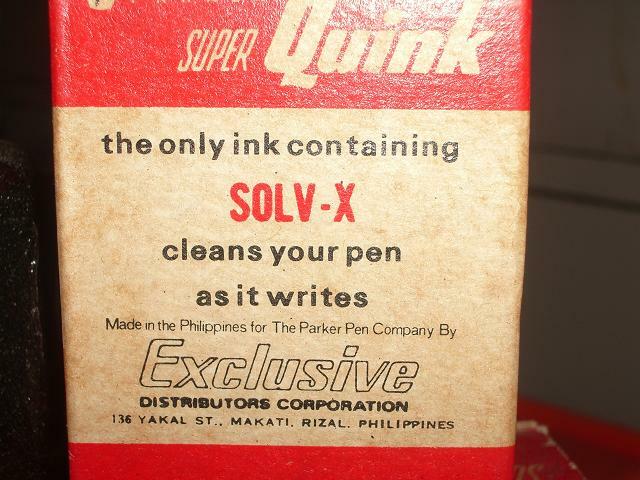 You are correct by saying: An ink manufactured in the Philippines is not proof that the ink was invented by a Filipino. (I couldn't agree on you more). What I'm trying to say/convey is that wikipedia might be correct, that a Filipino chemist studying in the University of Chigaco help them invent the ink. This is subject to debate. My point is, the book that the Shepherds wrote might be wrong/or missed a thing. It does not make their book perfect/or the absolute truth. This is subject to debate. 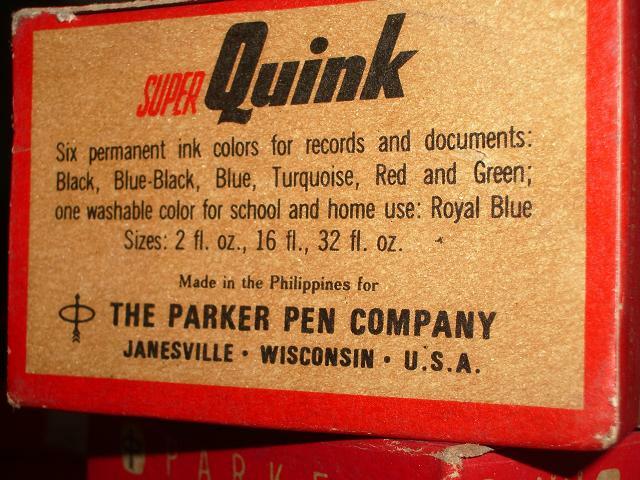 What the ink says: Made in the Philippines. This is just circumstantial evidence, but it does not mean, it the the nail to the coffin. Understand the Point? The point is: Wikipedia might be wrong, or it might be right. Do not close the book yet, keep an open mind. Edited by bat, 09 January 2009 - 03:55.
in the link, (click the link) Francisco Quisumbing. These ink bottles are from the 40's approximately 65 years old. Quink bottle picture here is probably from WWll since it says it is for V mail. Both of these bottles say they are made in USA. Draw your own conclusions and make of it what you will. I am just providing visual information for your consideration. You can see that ink made for the P 51 was marked as 51 ink. It says on the box that it is only to be used in the 51.  Edited by ANM, 09 January 2009 - 04:08. I have no doubt this ink is legit. You often see older bottles that were manufactured for other countries. As ANM pointed out, everything matches ink from the 1950s. 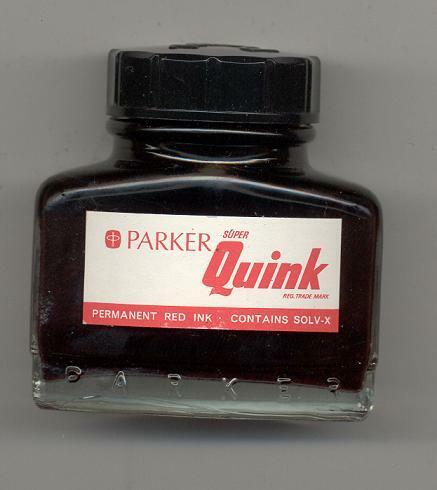 I think the main point of contention Griz had was the origin of the word Quink. It's generally accepted that it stands for "QU"ick drying "INK". And what is a reliable source? Very often, it's just someone who has read a lot. People reading the combined product of the human intellect are the same people who produce that product. The work of the mind is recursive. I contribute to Wikipedia. I've also written encyclopedia articles. Which one of my writing is more reliable? Is this reliable enough for everyone..
My guess is that it is from the mid 1960's. I think that is about when they started using all capital letters in the work PARKER with that font. Edited by ANM, 10 January 2009 - 02:07.